When the set was introduced in 1956, there was nothing like it, and there is still nothing to equal it. The Eameses' modern take on a 19th century club chair has not only endured for more than 50 years, it has become one of the most significant furniture designs of the 20th centuryâ€”instantly recognizable and enduringly fresh. Like all classics, the chair and ottoman get better with age, in part because of how they are made. From the innovative hardware that fastens the cushions to the shells without marring the appearance of the wood to the fact that each piece continues to be assembled by hand, the combination of craft and manufacturing consistency results in pieces that are genuinely authentic. "A special refuge from the strains of modern living." The Eames Lounge Chair and Ottoman has become so recognizable that its configuration is now a registered trademark. That form and the materials used to create it are an integral part of the experience the set delivers. Today, the chair and ottoman are available in a variety of veneers, multiple leather options, and two sizes. The same high level of quality and workmanship is guaranteed, regardless of the selection you make. An oiled finish is available for walnut and santos palisander veneers. It closely matches the look and feel of the finish used on the original rosewood chair, and will need to be maintained with periodic hand oiling. You can also choose the standard, high-performance lacquered plywood shell in wood veneer. The lacquered finish requires nothing more than dusting. The cushions will not flatten or clump over time. As Charles Eames described them, "The leather cushions do have built-in wrinkles to start with, but that is a clue that spells comfort to come, like the warm, receptive look of a well-used first baseman's mitt." Each hide used for the cushions possesses variations that are a natural occurrence in leather, and each will age to reveal its own unique personality. Like all classics, the chair and ottoman get better with age. Both are hand-assembled with great attention paid to the details. Shells are 7-ply veneers. Cushions are individually upholstered and replaceable. The back braces and basesâ€”of both the chair and ottomanâ€”are die-cast aluminum. The chair base has a built-in swivel mechanism. Shock mounts are resilient natural rubber. Stainless steel glides are adjustable. When they were conceptualizing the chair, Charles explained that the designers wanted it to have the "warm, receptive look of a well-used first baseman's mitt." As Charles and Rayâ€™s home provided the backdrop for the coupleâ€™s gracious hosting of a famously eclectic group of friends and associates, providing "a special refuge from the strains of modern living," so too the lounge chair and ottoman were conceived to provide welcoming comfort to the body. Part of the permanent collections at New York's MoMA and the Art Institute of Chicago, the chair and ottoman have been the subject of documentary films and books. They were the sole subject of a museum show at the Museum of Arts & Design in New York. They are featured prominently in television series and stylish movie interiors. 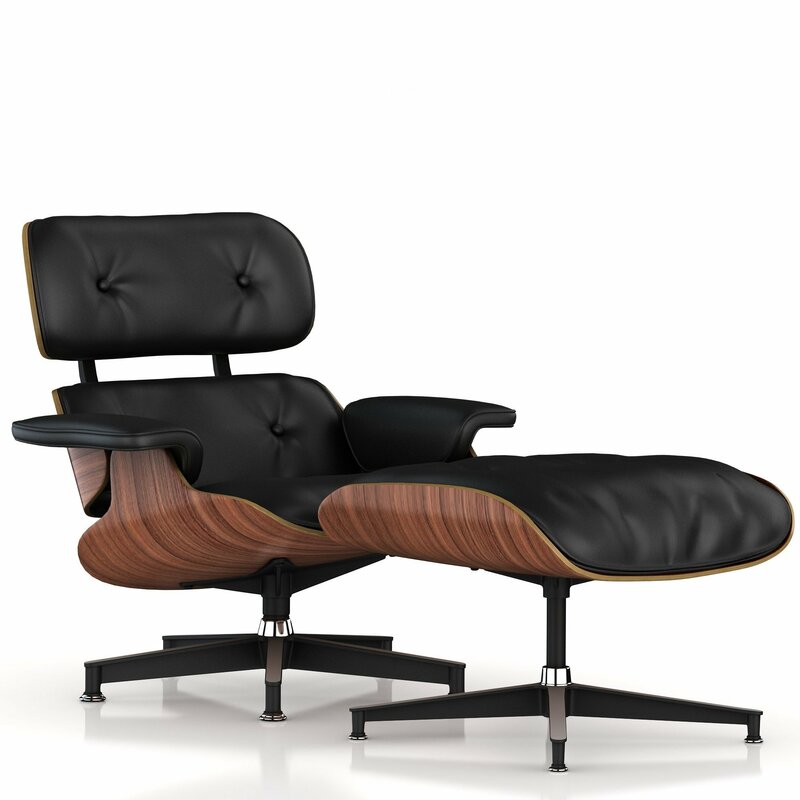 Although the word "icon" is overused, it's exactly the right word in describing the Eames Lounge Chair and Ottoman. This includes the Herman Miller Eames Lounge Chair and Ottoman with Rosewood, Oiled Walnut, or Oiled Santos Palisander veneer. For normal cleaning, dust furniture daily with a slightly damp, soft, lint-free cloth. Wipe dry with a dry, soft cloth in direction of the wood grain. To maintain the oiled veneer, very lightly brush wood areas with a fine Scotchbrite pad moving in the direction of the grain to open the pores of the wood and remove fingerprints and dirt. Never use wax-based products (Pledge, Endust), aerosol-powered cleaners, polishes, waxes, abrasive cleaners, or oily polishes. Rub the entire surface with No. 000 steel wool in the direction of the grain to remove small surface mars, light scratches, and any build-up from previous oiling. Improve the appearance of deep scratches nicks by sanding the wood veneer lightly with no. 360 grit sandpaper in the direction of the grain. Use caution on veneered surfaces to avoid sanding through the veneer. Apply small amount of gunstock (boiled linseed or tung) oil to a clean, soft, cotton cloth. Wipe small sections at a time in direction of grain using a circular motion until the entire veneer is coated. Be sure to apply oil to all exposed edges of the veneer. NOTE: Only apply oil on veneer surfaces. Immediately wipe off any oil that makes contacts with leather, plastic, or metal parts. Wipe off excess oil with a clean, soft, dry cotton cloth and smooth in the direction of the grain. Within 10 minutes, rub again with a soft dry, clean cloth until the entire surface is dry. After about three hours, polish with a soft dry, clean cloth. Allow the oil to dry for 24 hours before sitting in it to avoid transfer to clothing. As the oil builds over time, the period between applications will extend. Only apply oil when the product looks dry. For spots and spills, wipe excess liquid immediately with a clean cloth or sponge; let the leather air dry. If the spot is still visible, further cleaning may be necessary. Sponge the entire surfaceâ€”seat, back, or chair armâ€”with clean, lukewarm water. Let the leather air dry; never use a hair dryer or other heat source to dry leather.